TYCO LFP Antifreeze is UL Certified antifreeze. This third-party tested and evaluated solution helps fire protection systems comply with National Fire Protection Association (NFPA) 13, 13R, and 13D, which require the use of listed solutions in new antifreeze systems. Existing antifreeze systems must meet this requirement by 2022 under NFPA 25. LFP Antifreeze is ideal for use in a variety of applications where a sprinkler system could be exposed to temperatures below 40 F. It helps ensure fast and effective flow in water-based fire suppression systems and protect pipes against damage from freezing in temperatures as low as -10 F.
LFP Antifreeze is suitable for use with most common piping system materials, including CPVC. 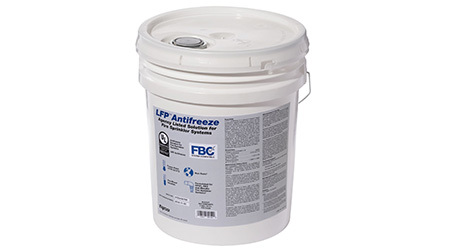 LFP Antifreeze is environmentally friendly and can be easily disposed of through normal sewer or septic systems (when in compliance with local laws and guidelines) or at local waste water treatment centers.